Yesterday, I was supposed to make some extreme stitching progress. In the morning, I psyched myself up for a grueling, record-breaking day of embroidery. I wanted to accomplish two things: preparation of website content (I had a few tutorials in mind), and arriving at the next stage of the Mission Rose project, which has stalled somewhat due to website work. After several months of working on the Floral Sampler Alphabet and the Mission Rose project, as well as a million other little things for Needle ‘n Thread and several other projects needlework-non-related, my workroom had morphed into The Very Large Mess. Sometimes, I wonder if I use “Tidying Up” and “Organization” as an excuse – as a delay tactic? Deep down, I probably do. But I know that if I tidy every day – if I take 15 minutes at the end of a work day and tackle the clutter-prone areas – then things will not get out of hand, and it won’t take a whole afternoon to re-organize and tidy up. Yep! I know this! But… I don’t always practice it. And after a couple months with little regard for those Nefarious Clutter-Prone Spots, when I sat down to stitch yesterday, I was visited by the Disorganized Workroom Blues. I tried to ignore them. 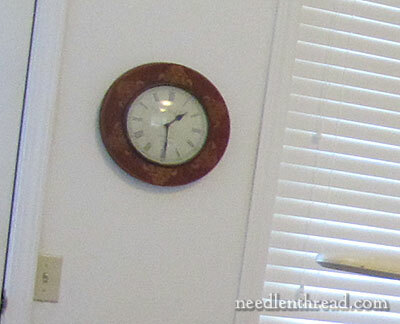 First, I attempted stitching two Stitch Fun Tutorials and photographing them. 136 photos later, and two C-R-A-P-P-Y examples of embroidery later, I switched to the Mission Rose. When even your basic embroidery stitches are not turning out, don’t switch to goldwork. …and yesterday afternoon, at 1:30, I snapped a photo of my cluttered workroom, and I started. I took the photo, because I wanted to share this experience with you. After all, if you’re not sympathetic to this particular plight, who in the wide world would be? You were expecting a pristinely-organized, cleaned up space!! It doesn’t look all that much different, does it? Well, I hauled some shelves out, cleared out boxes and bins, and hauled away a good amount of stuff to the local thrift shop. You can’t really see all that. I went through my tool and project bins that had gotten out of hand. All stray threads were put in their proper homes. And at the end of it all, I felt the Blue Cloud of Disorganized Muddle-Headedness lifting slightly. And the Bright Rays of Organizational Content were breaking through! Today, I will finish that job. And then, I will stitch again in Peace and Happiness with a clear mind and a clean conscience. Now, for some people, I realize that their “creativity flows better” if they are in a bit of a mess. For me, I can still manage creativity with a bit of a mess, but not with so much of a mess that I can’t find things I need, or that I have too many stacks without enough workspace. But what about you? Are you a neat-nick in your workspace, or do you tend to clutter up quite a bit? Does clutter prevent you from moving forward with your projects? Do you religiously keep your space tidy, or do you let things slide and then play catch up? Do you have any tips for keeping your workspace tidy? Would love to hear your take on the subject! Have your say below! February 8, 2019 Let’s Talk Project Organization – for One or Many Projects! That sounds like my spice cabinet! I have about 3 of everything! I’m so glad you said it first: “It doesn’t look all that much different, does it?” I was feeling bad that I couldn’t see much going on between pictures one and two. But you know what you did and what had to go. That’s what makes stitching easier. Yes, I’m a person that needs to have things fairly neat before I can work. Otherwise, all that stuff screams at me for attention. Even in the kitchen, I have to have all the dishes washed and put away before I start in on another mess. does it get in here. I them go in search of the plastic keepers for new bed linens and start sorting these bags are great for storage and a quick clean up. What a perfect topic for today! That is exactly what I am avoiding! I love your cabinet with all of those little drawers (at the end of your worktable). Would you mind sharing where you got that little piece? Thanks! I usually try to start a new project with a neat work space, but as things progress my space seems to get smaller and smaller and the piles of stuff get higher and higher. Then it starts to encroach on other areas in the house. This keeps up until I am finished with the project and neaten the area or the house becomes a major health hasard and I have no choice but to clean. This is too funny! just as I was think, all those hours, and it doesn’t look much different, you come in to explain. Yes, I get it. And I can not work in total confusion. I do need some ability to lay my hands on what I need. A bit of confusion is fine,though, since juxtapositions of materials and ideas often act as triggers for new ideas. Just what we need, new ideas to add to the long string of other ones waiting for some attention! I send on a lot of your blogposts to my EGA guild members, who just love it, and in fact one of them was stitching away at our meeting last night on a kit she’d got from you. Yay. Could it be in the air? I am going through the exact same thing!!!! I absolutely cannot start one more new thing (or continue one more thing) until I get all the needles, thread, felt, acorns, projects which need to be archived, etc organized for the winter. Absolutely!!!! I am a messy person! I can easily pull out supplies for a project, but am not good about putting things away. I begrudge the time it takes to straighten and neaten. My husband recently put large shelves on all four walls of my studio, and this has helped considerably, but I still have stacks and “stuff” everywhere. It used to embarrass me, but I am working to focus on what I create out of chaos, instead of feeling guilty. I try to have a semi regular cleanup day so you did, but… I guess at’s just who I am! This is so me. My boyfriend put up lots of shelving and built me some storage. I still have piles that are future projects lying everywhere. It gets worse when I don’t put my ironing board away at the end of a sewing session as it becomes another surface for piles. You call your “beginning of the day” photo of your workroom a mess??? That is something I aspire to!!! I do “hear you”, however, about your ability to work and be creative. I think that is one reason why I like to attend classes — it is away from my workspace AND my only job is to concentrate on my embroidery for that time. One of my “when I grow up” goals has always been to be organized and provide myself with a good, un-cluttered workspace. I have no one to blame other than myself for my not having such a thing — and I am pretty sure I HAVE grown up!! haha And I am still working on that organization thing! In the immortal words of Monty Python, “I know I have”. I try to keep tidy, but somehow I always end up with several projects in bits and pieces all over my little (8’x10′) studio, plus various supplies I can’t put away because I can’t reach that box, plus several other things I’m trying to decide what to do with… So it’s a never-ending struggle, and sometimes I give up and reorganize a drawer-full of beads or something, just to clear my head. Actually Mary your room after the clean up looks a bit more organized than before. I live in a 2 bedroom apartment soooo I have to be organized. I have for each project containers of all the threads I need for that project and colours are separated into individual containers that way I can keep myself organized. Otherwise I would be in a mess. Also I find I have to do one project at a time from start to finish or I would be in a total Mess. Your room or studio looks wonderful wish I had that space. Have fun and Have a great day everyone. Wow, if that is your workspace in disarray, I now feel downright suicidal!! If I took a picture of mine…well, I just shudder to think what would happen. I have begun to worry that I am a horder. It doesn’t help that in addition to my passion for embroidery, I also spin, knit, bead, and quilt. Supplies are stacked in every single available space, and then on top of what is already stacked. If Mary suggests a new project, I buy it AND all the supplies for it! Amazingly, I know where everything is, but I am SO much happier when it is neat and tidy. Since I work fulltime, however, I begrudge any time away from stitching to clean it up. I also discovered long ago that if I force myself to work on a project when it has fallen out of favor, I make mistakes. So I usually have as many as ten projects active, moving from one to the other as the mood strikes. In my defense, I always finish a project, but it surely makes for a studio in constant disarray! Except for the working full time (I just retired), I am a kindred spirit…. 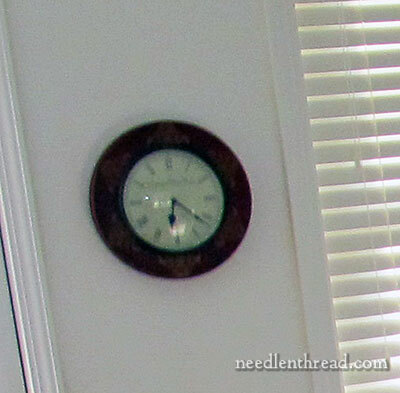 I have many needlework hobbies, and have too-many-to count going at any one time…. I have a good sized room, with lots of cupboards, but I still have stacks on the floor…. even when I think it is picked up, it really wouldn’t look that way to some. I love having different kinds of projects going, though, as when I feel like knitting, or appliqueing, or working on some embroidery, I already have a project in progress with everything I need at hand…. well, sort of! hee, hee – your “mess” looks pristine to me! My sewing room is so little I do have to keep it pretty organized but when I am working on an embroidery project I like to spread out all my threads etc on the table I have the hoop stand on. And I wish, wish, wish! I lived close the thrift store you donate to! This post made me almost laugh out loud! My work space is always cluttered and when I clean it always looks the same too. But I know what you mean when it gets away from you. below is the link to the photos I posted after my last surge to finish a project. I actually had to pick up a little before I snapped the photos because I was afraid of my husband’s reaction! sapping my creative juices. So my plan today is to cull and clean and put away so that I can sew happily another day. I plan to make a sign of your last sentence, Sandy, for my studio wall, when I get organised! Kath. Wow, your before picture would be heaven sent in my studio. I can hardly walk in the room. Since January, I’ve been saying that I need to clean up the mess from Christmas creating and it’s September and things have only gotten worse!!!!! I like doing many creative things which probably adds to my disorganization. It’s so messy in the room I’m supposed to work in that things have spilled over into a spare bedroom for sewing, the master bedroom for needlework, the dining room for paper projects and the kitchen for felting. Actually, I am going to go take a picture right now and see if that will inspire me to get busy! I just copied an idea that I got from my daughter-in-law and made a pegboard for my sewing room wall. I took a huge picture frame that I had bought for a photo prop. I measured the opening and then went to Lowe’s and bought a piece of white pegboard to fit. I was able to hang up all of my quilting templates and rules that I had no where to put. Even have my scissors hung up there. It looks fabulous! My work space is small so there is no room to be much of a clutterer. Actually it began as a sun porch. That is small!!! Sometimes it does get in a mess, usually when I start a new project and fabrics are everywhere. But before I begin cutting fabrics, they have to be put up and out of the way so I can cut (only one table connected to my sewing machine). And so, keeping your quilting space small is one way to avoid clutter like a room that is only about 8×8 feet in size, fabrics in plastic boxes underneath the table, etc, etc. Oh, there are two walls full of windows and one wall has double doors. Plenty of light but no wall space. The other wall has a double opening to the dining room and I have a four foot space as a design wall there. How I long for more space but what would I do with it? I have a computer office room and all of my quilting books are there. Keep your room small and clutter has to go somewhere. I just reorganized a portion of my craft room this last weekend. I have a friend who does clean everything up everyday and I have always wished I was more like her but it seems I like to work on my projects right up to when I have to go do something else be run my daughter to some event or just to stop and make dinner. So when the work space gets to the point that I can no longer relax and enjoy my project I have to put it aside and take care of my mess. It always feels good when it’s done but I am not good at getting rid of things so it gets harder and harder to achieve the level of organization I covet. Oh well, when I am going through the process of organizing I always find things I forgot I had to it is maybe a good thing I don’t put everything away every day. Solution: Just put extraneous things away in a drawer somewhere to deal with later. Only leave out things you are currently working on. Just don’t look in the drawers. Oh, thank goodness I’m not the only one! After each project I have to spend a day doing nothing but putting everything back it’s place and cleaning up. And my studio is only 10X10. Sometimes, I can hardly move in there. If I leave my cutting table extended and use a tray table and have the rug out for the dogs to visit and……well, you get the picture. I have two large work benches (for want of a better word) and still I clutter up the cutting table and the tray table. I can hardly find my scissors or needle threader. And after each project I say to myself, “I will put everything back in it’s place at the end of each session”. I lie. Tell me about it!! I recently moved my sewing/craft room into my daughters old room with so much space. I keep craft and supplies on one side of the room and sewing related on the other. With so much space you would think there would be no way to clutter it up. Oh contraire! If I didn’t have many many baskets to put things in it could be worse. But I do find I forget projects I had in mind when I group them in a basket. Oh well, as my mother (and a bumper sticker) once said “I have the most fabric and I’m not dying until I sew it all”. I know this phenomenon all too well, procrastinating on cleaning, then procrastinating on a project while I clean. I try to tidy at the end of a work session, but it still gets away from me. Often. I think I can tolerate much more mess than you, but I know I work better when I’m organized. I think I actually do most of my cleaning when I’m avoiding some other task I don’t want to do. Whatever works. Sometimes I get fanatical about organizing every last little thing, though I know it isn’t really necessary. I think organizing something like my button collection, by color, can be soothing and make me feel contented, as though I’d actually accomplished something. I suppose it helps on the rare occasion I’m looking for a button of a certain color, but I’m not sure it was worth the initial investment of time. I’m envious of your nice workspace, but I’m surprised by the whiteness of it all. You don’t have much up on display around the room. Is this intentional, or for practical reasons, like it’s hard to display things on the doors of your cabinets? Ha ha….I spontaneously organized my button collection two days ago, by color and tied all the matching ones together! It was some kind of therapy I needed I guess, and even at the time all I could do was laugh and shake my head at myself! OH Mary, what a timely post. I live alone in a two bedroom apartment so my sewing, quilting, embroidery and crafts kinda take over the whole place. I’m in the middle of a drape order, a quilt for my niece, an embroidered bag for my sister and it’s canning season(this past weekend a bushel of tomatoes, a bushel of peaches, a bushel of apples and a half bushel of green beans in 95 deg weather) Not to mention starting Christmas presents. I woke up Monday morning and couldn’t get to the coffee pot. I find that the more cluttered my house the more cluttered my brain especially without morning coffee. I spent ALL day Monday (finding the coffee pot first of course) putting everything back into its place. But it was so worth it because today I can start the fun stuff again with an uncluttered house and mind. My workroom, 30×18′ must house all my hobbies witch include quilting, beading, sewing, spinning, surface embroidery and most anything that has to do with fibers. In the winter I sometimes knit or crochet. You think your work room can get in a mess, you should see mine after I have neglected to put things back where they belong. I “try” to do this as I finish each project but sometimes I am so anxious to get to the next one I let it slid ‘one more day’. When I begin to make mistakes and have to play the frog song ‘ripitt ripitt’ too often I stop and set about putting every thing in order. This activity seems to clear my mind and even on occasion give me some new ideas. When all is right in my world I’m ready to set down with renewed energy and can really make some progress on my project. I am a widow now and have nether chick nor child making demands on my time. Some of us seem to work best in clutter and others demand perfect order. Guess I fall in the middle. Your newsletters are so inspiring and I look forward to having my morning coffee with you each day. Keep up the good work. This seems to be a subject most of us grapple with, thanks for inviting us into your mess! I need my studio to be far more organized and uncluttered than it it most of the time. I use my studio for sewing as well as embroidery and bead weaving and as my writing space (I am a poet). I have been working hard for the last few years to find ways to make my space work better, and have learned a lot along the way. There is a magazine that focuses on women artists’ studios (I’m forgetting the name), and I spent many hours looking at pictures of studio spaces to see what worked for other folks. What has been really helpful is to look at the spaces I instantly hate & then figure out why. I realized I need a simple physical space to work in (like you have)–no ruffled curtains or clever frilly storage. In looking at these studios I realized I need enclosed storage, no dust and less distractions! Something else that has helped has been to pay attention to my mess when I clean. In doing this I discovered 1) under many of my piles were empty (!) storage containers. 2) there are some supplies I buy that may or may not leave the bag once they get home, but there are other supplies I use immediately. Thus, no impulse buying allowed of those supplies (like fabric) that I don’t feel compelled to immediately use. 3) I overbuy even silly things if I don’t pay attention. Yes, buy extras of the beads or floss if color matching is a concern, but no, I do not need three extra rolls of florist tape–they are not going to run out of it in every single local shop. The final helpful thing I’ve been doing was inspired by one of your blogs. I have one of those hanging storage things that has small, see through pockets of various sizes. I have one on my studio wall where I put projects in process (with all the supplies & reminder notes), jewelry repairs I need to do, or small projects I want to do but haven’t started. This moved a lot of my small piles off of work surfaces, and it has helped me to finally finish up those projects & repairs. I’d love to hear more details of what’s worked for folks! Oh, how timely! I had the work table clear six weeks ago, going off for surgery, thinking I’d heal better with the house organized. It’s coming back out again, little by little. Sewing, spinning, and my casket of curiosity have all opened up again. But you know, maybe it is in the air to want to clean it up and organize. The squirrels around my house are going nuts! So it’s in the air, good excuse! I’m another one that would be awfully happy with your before picture. 🙂 My studio is about 32’x16′ and houses sewing (quilting and clothes), spinning, knitting, beading, and now weaving. It is easy to get a project or two out at once for all of those. I think we all just have different levels of Maximum Tolerable Clutter. Coincidentally, I reached mine too, and need to clean up. Maybe I’ll take a before and after pic too. I looked at your before picture and was amazed. My work space does not look that good after I organize it. Happy Stitching! Yes,yes, yes! Sometimes I think Fall cleanup is even more important than Spring cleaning! By the way, I noticed that you do not keep anything on your walls for Inspiration. Is that a deliberate choice? Would pictures, posters, or the other idea doo-dads that we accumulate distract you from your work, or do you have a particular reason for keeping your surroundings bare? I would love to hear about it. I feel for you, my sewing/work space is so bad I have morphed into the living room for my embroidery. I call it my “nest”. My husband is not amused. It is very depressing to have a messy space to work in and very difficult to take time to tidy it,when it get’s that bad. I usually get side tracked into another project. Laugh! Think I will go and try to tidy up, but just a bit, it much more fun to stitch than clean!!! I do not have a work room, just a grab and go box and a couple of small storage locations, but I do keep them religiously organized, and do spend 5 minutes every evening doing so. I do it not because I dislike clutter, because I am okay with a smidge of clutter, I organize it because I do not want my two kitties to have access to pincushions full of needles or floss stuffed needles that they may be tempted to goof with and swallow. I say this because a few years ago my cousins cat (she does mending and only uses needles a couple of times a year) swallowed a needle and it was a double whammy to the family finances to take care of the vet bills. I do only use DMC, but I also do not want my kitties to goof off with skeins of floss or shred my fabric, so I keep my embroidery stuff religiously organized. I can’t tell you how comforting it is to see other people – any other people – in total confusion! I have no trouble at all stitching in said mess. And then one day it all gets too much for me and I can do nothing, either stitching or tidying. Eventually the spirit moves me to sort, but it is an unnerving experience. The straightforward things are fine but where in the world do I put the odds and ends?? They are almost more frustrating than the mess! Never mind, I adore your work; the tutorials; the projects and particularly the entertaining emails. Thank you. Thank you. Looking forward so much to the goldwork. I think your studio looks great, the before and the after! But since you feel it needs to look better and be more tidy I have some advice. Set your timer everyday to clean up for 15 minutes and no more than 15 minutes. Even if there is more to clean don’t do it, you will get to it the next time. The place will look better over time and you won’t have a huge mess to clean. Don’t make this a big project, it’s called baby steps and I learned this from Fly lady.net. It works, I promise! What a great idea Chris. I’m going to try that. who actually enjoy the organizing process. to work on next, so I need things tidy. Oh Mary, I feel your pain ;-). I have a 10×10 craft room that has 16×16 worth of my treasured crafts in it. My A/C unit is on the other wall and I cannot expand. NON-crafters tell me to cull it out and be happy. BUT…it’s MINE! Dilemma of all dilemma’s….. I’ve already sent my sewing to another room and it is better but I have no other “expansion” areas. Any advice? Anyone? I play catch up and reorganize piles of scraps. I usually end up taking one day a month to vacuum and put all of my fabrics and threads away so I can start over again. My quilt frames end up being dropping spots for all kinds of things and spools left on the table become toys for my kitty which them need to be retrieved from the floor. My clean room looks like your messy one, so don’t feel bad, just enjoy your efforts and know we appreciate you. Actually I think it looks great. My workroom, well, let’s just say a basket of embroidery floss fell over onto the floor and I found it is so much easier to step over the mess than to actually pick it all up and reorganize it. Oh, and to close the door so I don’t have to be reminded and work in another room. Pitiful! Oh, and to ever put a basket of sorted embroidery floss on top of embroidery booklets, finished embroidery pieces waiting to be blocked, or pieces already framed. Yea, that pile was an accident waiting to happen. I confess, I too work like crazy, and then look up to realize how messy and unorganized I have become. Nothing goes right, until I clean it up. I am usually very neat, but don”t always take that few minutes at the end of the day either. It is good to recognize when we need a break from creativity. Your space looks very tidy and ready to promote the next project. The small drawer cabinets appear to be an excellent solution to on-going clutter. Are they IKEA? I read your blog every day and enjoy so many of your projects. Mary, I am always grateful when you share tales of embroidery not quite going as planned, it makes me feel better. I know what you mean about some days where you do nothing but chase your tail. I have to say though, I envy your work space, even if it is a tad cluttered sometimes. I live in a rather bijou curatage with my husband (the Revd Dr) and my little boy, aged 5. There is no work room, no spare bedroom, not even a little corner where I can set up a work station. The Revd Dr has his desk in our room,The boy seems to take up the rest of the house!so in the evenings after work, and after dinner and after bath time, bed time and clearing up time, I have to unpack my bits and bobs from a million baskets, boxes and cubby-holes (this all takes quite a while; being a disabled wheelchair user probably doesn’t help). It seems that I’ve only just unpacked and it’s time to pack up again! I really wish I had a work room. Knowing me, it would soon be a productive mess – organised chaos! But so much better than trying to keep my materials politely out of the way so that goldwork wires remain unmingled with Lego and sermon drafts! I have been at it for several months in between working and projects adding cabinets and drawers to organize things. I think being organized and finding what i need when I need it is as important as the project itself. I say that because when my space is too cluttered I feel it’s a block to my creativity. And if I have to continually search for what I need I get frustrated and give into the temptation to not start. I love that your “stash” is kept for the most part behind closed doors and drawers. That’s what I’m working toward as well. The less distraction the better…. I too have a problem with neatness! My dnl says I can’t have a clear spot with out putting something on it, most of the time it’s not just one thing but a bunch. I think I would like to go to the St. Marys thrift store. Hee, Hee! 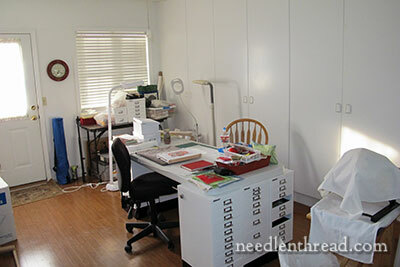 Yes, my craft, sewing, embroidery room gets disorganized while I am working on 1 project or multiple projects. I’m with you in that I can get more done in a cleaned up room. Well, truth be told, none of the stuff I hauled was needlework related! If you want an old fan, though…..
Mary, you gave me my laugh for the day. I wish my workroom looked as neat as your messy room! I am organized and usually have 2 to 5 projects going at once. And, I do know where my supplies are even in the mess. I heartily agree with the “Disorganized workroom blues”. I just never knew that there was a name for the syndrome. Now….. how is your jewelry drawer? That is always good for an hour or two of “thinking time”. Oh, Mary, I am giggling here. Your “before” photo looks far better than my space on its best days. I’ve been making a diligent effort to organize and catalog my “stuff” recently, but it’s going to take more than several hours. Hopefully, implementing the 15-minute clean-up rule will help me keep things tidier. If I ever win the elusive lottery, I am going to hire an organizer strictly for my sewing room! Oh, why did you have to remind me? I have put off cleaning my work space for (I hate to say this)two years. I would dash in, grab what I needed, and shut the door. It took my husband deciding to begin a long-desired remodel project to force me into the room long enough to pack and remove the contents. I will still have to sort, organize, and dispose of the contents of said boxes when the remodel is over. 🙁 I resolve to not allow the mess to get so far out of hand again! I am like so many others I think. I let things go until I can’t stand it anymore. It’s usually when I need to put my hands on something and I…can’t….find….it!!!! !that I dig in and get busy and start putting away. My biggest problem? A workroom that serves as a bedroom too. When it gets too messy I just can’t stand it. I am normally a person who likes an open, clean room to work in. When the bed is full of stuff, the drawers have stuff hanging out of them and I can’t find my scissors…well….I’m in a real tizzy. Oh dear, Mary! If only I could get my studio to look like your “before” picture, I would be happy. There is a path down the center of my room, but if you see me on the “Hoarders” tv show, please send reinforcements! Hi Mary, I have to have a tidy place to stitch. Like you my sewing room is not to my liking, so I will take some stitching into the lounge room!!!! Reading your thoughts, I know what I will be doing this weekend!!!! At it’s worst your workroom looked better than mine cleaned up. I think we may have been separated at birth. In time mine gets bad enough that I take a day or two (sometimes as much as 4) and bull doze out the entire area, haul stuff to the dump, goodwill, and into tubs to go to my embroidery guild’s flea market fund raiser. Then I move things back, organized, and I love the place for maybe as long as a few months before it starts getting to me again. I’ve stopped going into my craft room; each time I do I just make it worse…I must, I must, I must clean it up someday!! But, I’m too busy stitching!! I hope I am not overstepping here. However, your workroom is stark white with absolutely none of your personality. I’m sure you have a space for everything and when things are put away things are organized and tidy. I have found that if one doesn’t feel comfortable in a room it becomes a room which is just a closet. Color, work on walls, or even a window treatment would warm up your space and you would want to spend time in it and it would stay tidier. Every single time I do a massive grand-scale scouring of my workspace I swear (most seriously) that I will NEVER let it get like that again. I will (yes, I WILL) put things away as I finish using them and never, ever will I let it get in such a sorry state. Yep. I’m pretty sure you can guess where this is going and you would be exactly right! I’m very much on the ‘neat nick’ side of things, almost to obsession. Although in my defence I actually have to be because my ‘sewing room’ is a table in the dining room…open for all to see. On the up side it proudly displays my new sewing machine and overlocker (my gift to me). I wish mine was only as cluttered as yours. I have to many projects going at once. Embroidery, applique, crouching, needlepoint & quilting. I thought your cluttered pic was so tidy! I have stuff everywhere and tend to work on the edge of the table. At the end of a section/project I put all stuff finished with in two piles, filing and stuff to be put away, back where it belongs, (mostly threads) and I wait till the spirit moves me to deal with it, usually when I can’t find something I know I have. I am getting better and tidy more often than I did, realizing most of the stuff I have pulled out I don’t use anyway but it helps the creative process. I have a very high “chaos tolerance” level but I know it is out of hand when I have to buy duplicates of things. We full time in an RV, last year I got a “studio/shed” but when we left for the summer it was a mess and I did not have time to clean up. Now I have to integrate what I have in the RV with the studio – big time clean up coming! thanks for sharing. I gave away beads, and sold some things. The mess seems like it will NEVER leave. Out of control. You call that a mess? My worktable normally looks like an over-decorated crazy quilt. The ‘get organized’ bug must be going around! This past weekend when I tried to start a quick little owl pillow featuring machine appliqué, there wasn’t a single square inch of uncluttered horizontal space to be found 🙁 So like so many others, I spent two entire days going through piles of magazines, inventorying the ideas contained therein for use later, sorting and re-filing threads, refolding and re-piling quilting fabrics, culling, and generally chasing away those ‘I don’t know where to start, disorganization blues!! !’ Now any project I choose to do will take 1/4 of the time because I won’t have to continually move the ‘piles’ in order to access my cutting mat, sewing machine, serger, and/or ironing board. Yippee!!! I had a college class in work simplification it provided me with rationale for my organization. I find tidy and organized to be soothing. It allows creativity to happen without distraction. I have several banks of drawers, some built-in others rolling that help me “have a place for everything.” If a drawer is too small then I have small, medium and large boxes or baskets that hold collections of like items. I taught middle school for 33 years and constantly reminded students “if you took it out, put it away.” I try to finish each day/session with that hint. I don’t always succeed. My downfall is my cutting table (or other horizontal surfaces) that end up being the repository of stacks of sorted items. 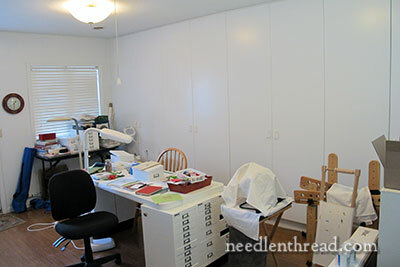 When my son left home, I moved my sewing into his 12’x12′ bedroom. In there I have a desk for scrap booking, a large table for embroidery work and a separate table for doing patchwork and quilting. I only tidy up when a quilt is complete, never before. The embroidery project is always out so that I can add a few more stitches any time. I’m very fortunate to be able to close the door and leave things as is. When my daughter married I set her room up as a guest room. So far neither have been home visiting at the same time! It’s a fine line between being immersed in creative inspiration and downright clutter! If you take 15 min, or so, each day you will loose a lot of stitch time. It is faster to do it once a week, month or so. When you can’t stand it clean it! Looks good, good job! I hear you all on the storage dilemmas. That is what I am working on today as wll. I saw and article on thsi book and thought you all might like to see it. I have only read the first comment and already feel as though I have run into a kindred spirit, as Anne might have said. Books is my major problem when it comes to duplicates. It is relatively easy to ‘hide’ some supplies, like threads and so on, but two books the same stand out on the shelf and DB (aka Dearly Beloved), although never angry, does seem to be a tad frustrated with my disorganisation. My studio is separate from the house across the deck which is really nice is some ways, but is absolutely the pits when it comes to keeping it tidy. And I can not work properly in a mess. So at the moment I am not doing much work out there at all, just some crazy quilting inside the house. But I can feel the time fast approaching …. But if my studio/workroom looked like yours Mary, even in the before photo I would be very happy. I, too, would love some tips to remain tidy and organised. Presently, each time I look at the room where I usually sit to stitch, I want to run away… and always find something else, very urgent, that needs doing! I do think that your work place didn’t look that untidy to me, but then you are far more organised that I will ever be. Believe me your ‘before’ picture was nothing compared to mine. If we had hurricanes in London I would blame it on them, it’s got so bad I take projects into another room to do, but that’s now starting to look like the first! With the weekend coming up, I think you may have just inspired me to at least clear one area, and I am sure this will get my creative juices going again, rather than looking in the room and shutting the door again! Don’t know if I am brave enough to take pics though! Hi Mary, As I am originally a sewer after doing a Tech course, then a Smocker who became an Embroiderer because smocking became unfashionable. Followed by Patchwork when my cataracts needed removal. Now I have a large sewing room full of stock for each of these activities and no room to work. So into the sunroom I moved where I occupy a small area and have to clear up regularly to fit all my current works in each activity in this space. Sadly my sewing room has become a store room. My studio is also our home office, so not only do threads and fabrics gat out of control, but there are constant paper piles to deal with as well. I consider it “neat” when the projects are all tucked away into their baskets, the paper piles are reduced to one on the desk, and the little table by my stitching chair can accomodate a cup of tea without endangering any materials, stray family members (who seem to think that this is an auxiliary family room), or the cat! Often I work and work and work without cleaning up after myself and then need to take an evening or a morning to restore order. I find that not only does everything get cluttered but I then fool myself into thinking I don’t have that essential thread, tool whatever-buy it and then find I had it all along. No matter how much I try and organize it never is right and I am always searching for a better method. There is no point (in my opinion) of putting away the thread you will be using again tomorrow. That said, putting the thread away at the end of their use doesn’t make things look all that much better, but it makes a big difference to whoever is working there. I can appreciate leaving some stuff and keeping the mess to a minimum. I’m sure I’m not the first person to say this, but if that’s your definition of a messy room, I hope you never see mine. I can see a difference between your before and after. I must say that your “mess” is about as neat as my “clean”. I think much of that is due to your nice clean-lined cabinets and great lighting vs. my open shelves stuffed with books and poor lighting. I tend to clean up in spurts. Right now I’m working on fabrics – pulling them out and refolding them neatly after considering whether they still have a place in my stash. I think my embroidery threads and yarn will be next. I love your workroom, I agree about the delay tactic thing..so true for myself. I have to tell you that you and all your info and tutorials inspire me. I am truly grateful to have found your sight and to have this in my life. Thank you for your never ending information and photos on so many subjects. You are the best!! Wow what a clean up I bet you felt better after that even if you didn’t achieve as much stitching as you had anticipated. I do sympathise with you on organisation of workroom, I have a very small space so I have to be semi organised otherwise I can’t move and when things get messy like you I can’t concentrate on my sewing so I have to tidy before I can embroider. I hope you were able to get down to some serious sewing. Thanks for sharing this with us. I am very organized with my threads, tools and fabrics but sadly for active projects, their place is often under-foot or under-elbow. Storage towers and containers designed for scrapbooking are great for embroidery supplies. The containers are clear in varied colours, 18×18″ and shallow. Michael’s crafts also sells vertical cabinets to hold them. My DMC threads are all in a large fishing tackle box given to my husband when changing jobs. I claimed his and gave him the smaller one I already owned. Couldn’t waste good storage. I took a good hard look at my workshop and decided a really good tidy up was needed ! I spent all afternoon and it looks a lot better but there is still some way to go . My main problem is fabric ! I seem to prefer embroidery ,Stumpwork,gold work so I have to decide what to do with all the quilting cotton and suchlike …..
Keep up the good work I love to receive your newsletter. Oh Mary! My workroom shares space with my office – writing and sewing to create a REALLY BIG MESS. Especially as I have ME and have to wait until the Right Moment. I tend to toss, stack, and pile stuff – especially when I am finishing a project or looking for something – I know you are right, 15 minutes a day would work wonders. I can’t tell you how comforting it was to hear you, too, stiff yourself with those Workroom Blues. thanks for letting us know you aren’t so different from the rest of us, despite your expertise, and that even you have days when the stitches just will NOT go right. Looking around at a Real Mess – I feel much better. I Will Try Harder! HA! We just turned my son’s old room into a craft room and I was in bliss when it was newly painted and organized. Then reality set in and messes began to appear, meaning projects were getting done. It was fun, but I found myself getting depressed with the mess. For me, I work best in a clear organized environment but sometimes it’s hard to find the energy to keep it that way. When it’s just me I’m pretty good about cleaning up, but my daughter claims she likes to work in the mess. I do have to give her LOTS of credit though because when she does clean up it’s done beautifully and she was a great force in organizing the room to begin with. So as long as we can work with our different styles of crafting we have a ball together and that’s what it’s all about. It was fun to see your progress of your day of cleaning your room though, thanks for sharing.